ANAHEIM—Patrick Sharp got the puck on the boards and abruptly whipped it in front to Patrick Kane, who scored before the Anaheim Ducks even knew where it went.Although the Blackhawks are still looking up at Anaheim in the Western Conference standings, they left a reminder of what will be facing the Ducks if these NHL powers end up face-to-face in the postseason.Kane had two goals and an assist, and Sharp assisted on every Hawk goal in a 4-1 victory Friday night.Jonathan Toews and Duncan Keith also scored for the Blackhawks, who beat the NHL-leading Ducks for the third straight time at Honda Center. Corey Crawford made 21 saves as The Blackhawks controlled the night, taking a three-goal lead in the second period. The Blackhawks bounced back impressively after blowing a lead in the final minutes of a 4-3 loss at Los Angeles two nights earlier in the opener of their six-game road trip.After a blowout loss in San Jose on Thursday night ended their six-game winning streak, the Ducks have lost consecutive games in regulation for the second time all season, and the first since Nov. 28-29 – another back-to-back set against the Blackhawks and the Sharks.And when the Ducks lose, they really lose: Anaheim has lost in regulation just nine times since Halloween, but eight of the nine were by at least three goals apiece. Frederik Andersen stopped 29 shots for the Ducks.After Rickard Rakell broke up Crawford’s shutout bid and briefly energized the home crowd with 9:54 to play, Kane scored his 25th goal on that brilliant pass off the boards from Sharp. Kane has scored at least 21 goals in every season of his eight-year NHL career. Toews put Hawks ahead in the opening minutes, beating Andersen with an unobstructed shot on a setup from Kane. The goal was the first from Toews in the Hawks last 14 road games.Midway through the second period, Keith’s shot found its way through traffic while Toews fell backward on top of Andersen, knocking down the Danish goalie. Boudreau angrily demanded a goaltender interference call, but didn’t get it on an unreviewable play.Kane made it 3-0 a few minutes later with a nasty shot for his fourth goal in five games.Anaheim had a two-man advantage for 25 seconds during a lengthy stretch of power-play time in the third period, but got nothing until Rakell and Corey Perry skated in on Crawford for Rakell’s fifth goal. NOTES—Andersen lost for just the fourth time in 21 games since Dec. 1. … Before the game, Anaheim assigned Colby Robak to its AHL affiliate in Norfolk after the defenseman cleared waivers. Eric Brewer is expected to return next week from his 24-game absence with a broken foot. … Keith became the fifth defenseman in Blackhawks history to score 400 points with his goal. PHOENIX—As they have so often this season, Eric Bledsoe and Goran Dragic pushed the Phoenix Suns to victory.Bledsoe scored 23 points and backcourt mate Dragic had 21 as the Phoenix Suns held off the Bulls 99-93 on Friday night. Bledsoe’s six-footer high off the glass put the Suns up 97-93. It came after a 7-0 Bulls run that cut the lead to 95-93 on Aaron Brooks’ layup with 31.9 seconds to go.Markieff Morris had 12 points and as season-high 14 rebounds for the Suns. His twin brother, Marcus, also scored 12.Derrick Rose scored 23, Jimmy Butler, 22, and Brooks, 21, for the Bulls, who were coming off a double-overtime loss to the Lakers in Los Angeles Thursday night and didn’t arrive in Phoenix until 3:30 a.m. on Friday. Phoenix finished 6-2 in a franchise-record eight-game homestand.The Suns led nearly the entire game and were up by 16 in the second quarter before a 22-6 run gave the Bulls their only lead since the opening minutes on Kirk Hinrich’s four-footer with 36 seconds left in the third.Brandan Wright’s layup put the Suns up 68-67 entering the fourth.Dragic’s layup after a slick pass from Markieff Morris gave Phoenix a 95-86 lead with 2:24 to play. The Bulls scored the next seven, including a 3-pointer and layup by Brooks, before Bledsoe and the Suns put it away. NOTES—The Bulls missed their first seven free throws. …they are is 1-2 halfway through a six-game road trip. … Jimmy Butler tweaked his knee in the loss to the Lakers but was back in the lineup on Friday….Phoenix is 16-6 since going to the starting lineup of Dragic, Bledsoe, Alex Len, Markieff Morris and P.J. Tucker….Gerald Green, the streak-shooting guard who usually is one of the first players off the Suns bench, didn’t play at all…..Bulls are off till their game at Houston on Wednesday. Bulls with ANOTHER bummer, embarressed by lowly Lakers! LOS ANGELES—When the Los Angeles Lakers blew a nine-point lead in 70 seconds late in regulation, they certainly seemed to be careening straight toward another loss in overtime.That’s when the young, patchwork Lakers discovered a poise they’ve never had before – just in time to avoid a historic defeat.Jordan Hill scored 26 points and forced the second overtime with a clutch jumper, and the Lakers snapped their nine-game losing streak in thrilling fashion with a 123-118 victory over the Bulls on Thursday night.Wayne Ellington scored 23 points and rookie Jordan Clarkson added 18 for the Lakers, who held off the Bulls for their first victory since Jan. 9. With big late baskets from everybody in their unassuming lineup, the Lakers avoided matching the 1994 squad coached by Magic Johnson for the longest skid in the 16-time champion franchise’s history. ”We can surprise a lot of people out there if we keep playing like we did tonight,” Hill said. YEAH RIGHT!! Carlos Boozer had 16 points against his former team for the Lakers, who got their first win since Kobe Bryant was lost for the season with a torn right rotator cuff.And it was fairly packed with drama. After longtime Lakers big man Pau Gasol tied it with 11 seconds left in regulation, Hill’s short hook shot at the buzzer rattled out. Hill hit a tying 20-footer with 16 seconds left in the first overtime, and Derrick Rose badly missed his 20-footer at the first OT buzzer. Ellington hit two early shots in the second overtime to put the Lakers up for good. Los Angeles made five of its seven shots in the second OT while holding on.All-Star Jimmy Butler matched his career high with 35 points for the Bulls, who rallied to force the first overtime, but couldn’t finish it.Gasol had 20 points and 10 rebounds in his Staples Center return against the Lakers, and he forced the first overtime with the tying tip-in.Rose added 17 points before missing that potential game-winner at the first overtime buzzer for the Bulls, who flopped after their thrilling win at Golden State on Tuesday. Los Angeles led by 15 points in the second half, and Hill’s basket with 1:29 left put the Lakers up 98-89. After Butler hit a 3-pointer, two free throws and a breakaway dunk, Gasol leaned over Robert Sacre and tipped in Rose’s miss.Rose’s 3-pointer to open overtime gave the Bulls their first lead. Gasol made one free throw with 35 seconds left to put the Bulls up 106-104, but Hill drained his long jumper before Rose failed to score on an isolation play. NOTES—Thibodeau said the entire locker room was ”thrilled” by Butler’s selection as an All-Star reserve: ”He has worked extremely hard to put himself in that position,” Thibodeau said. … Gasol had 23 points and 13 rebounds while the Bulls beat the Lakers on Christmas in the United Center……The Bulls and the NHL’s Blackhawks are both in Southern California on long trips while Disney on Ice takes over the United Center. The Blackhawks lost to the Kings in this same building Wednesday…..LA hadn’t played a double-OT game since April 22, 2012. … Nick Young missed his second game with a sprained right ankle. … Boozer is being paid about $13.5 million not to play for the Bulls this season. The Bulls got rid of the power forward using the amnesty clause last July after four seasons together. … Rock Star Tom Petty,Soccer greats David Beckham and Robbie Keane and MLS Commissioner Don Garber all watched the game from courtside…..The Lakers gave a warm pregame video tribute to Gasol, who won two NBA titles in seven seasons in Los Angeles before leaving as a free agent last summer. Gasol got standing ovations in warmups and again before the game, when he stepped to center court and waved both arms at fans wearing commemorative gold T-shirts. ”It was tough at first,” Gasol said. ”So many emotions. And that ovation at the start of the game, it was hard to focus. So it took me a while to kind of get settled into the game.”….Bulls play at Phoenix on Friday. SOUTH BEND—In a match of player-of-the-year candidates, Jerian Grant(Horace’s Son) made more clutch plays for eighth-ranked Notre Dame than Jahlil Okafor did for fourth-ranked Duke.Grant finished with 23 points and 12 assists and in the final 67 seconds hit a jumper just as the shot clock expired, fired a pass to a wide-open Steve Vasturia for a 3 from the corner just as the shot clock expired then blocked a layup attempt as the Irish rallied from 10-points down to win 77-73. Grant sparked the winning rally when he lost control of the ball at the free-throw line as the shot clock was running down, grabbed it at the last second and hit the basket to give the Irish a 73-70 lead. Grant added six rebounds, three steals and two blocked shots. On the pass to set up the 3-pointer, Grant looked as though he was holding for the last shot when he suddenly passed to Vasturia in the corner. It was the only basket Vasturia made all night. A year ago the struggling Irish stunned No. 7 Duke 79-77 by holding standout freshman Jabari Parker to a season-low seven points. The Irish couldn’t do the same against Okafor, who, like Parker, is from Chicago, just 90 miles west of South Bend. Okafor was a point shy of a double-double at halftime and finished with 22 points and 17 rebounds.But he was 2-of-7 from the free throw line, including 1-of-5 in the final 4:30. The win keeps Notre Dame (20-2, 8-1 Atlantic Coast Conference), which finished in 13th place in its first season in the league last year, in second-place halfway through the conference season. Duke (17-3, 4-3) is off to its worst start in league play since opening the 1995-96 3-4 after losing their first four league games.The Blue Devils didn’t come up with enough big plays against the Irish, finishing with 13 offensive rebounds but had just nine second-chance points. Zach Auguste added 14 points and six rebounds for the Irish, Pat Connaughton added 13 points and 12 rebounds and Demetrius Jackson had 10 points. Quinn Cook had 15 points for Duke, Tyus Jones 14 and Justin Winslow 13. NOTES—Brey, an assistant at Duke for eight seasons, beat Krzyzewski for the second straight time. He’s the only former assistant to beat Krzyzewski. Overall, Krzyzewski is 19-2 against former assistants. ”I don’t really look at it like that,” Brey said. ”It’s about our team now.”…..The Blue Devils failed in their attempt to win three games against top 10 opponents on the road for the first time in program history. They beat then-No. 2 Wisconsin 80-70 on Dec. 3 and then-No. 6 Louisville 63-52 on Jan. 17. … Okafor scored in double figures for the 20th straight game. …The Irish improved to 6-1 at home against top 10 teams at home since 2010, with the only loss coming against then-No. 3 Virginia earlier this month. … The Irish are 14-7 overall under coach Mike Brey against top 10 teams at home. … Notre Dame is 6-1 this season in games decided by five points or fewer. … It was Notre Dame’s 600th home victory since the Joyce Center opened since the building opened during the 1968-69 season. The Irish are 600-157 at home in that span. OAKLAND—One after another, teams trotted into rowdy Oracle Arena the past two months confident they could cool off the NBA’s hottest team on their home floor.It took 113 points, 53 minutes and one big shot from a former MVP to finally make it happen.Derrick Rose hit a step-back jumper with 7 seconds remaining in overtime, and the Bulls ended Golden State’s franchise-record 19-game home winning streak with a thrilling 113-111 victory over the Warriors on Tuesday night. ”Anybody can get momentum or anybody can get the feeling they can beat anybody when you beat a team like this,” Rose said. Rose, looking as healthy as ever, dribbled to his left and created space to get off the 20-footer over Klay Thompson, skipping around the court after the Warriors called timeout. Rose finished with 30 points, and his final basket overshadowed a night when he committed a career-high 11 turnovers and made just 13 of 33 shots.Thompson misfired a wide-open runner off the glass as time expired. The Warriors forced overtime on Draymond Green’s tying tip-in with 1.4 seconds left and looked ready to recreate their unbeatable spark in front of a sellout crowd of 19,596. But they couldn’t do enough to slow down a rejuvenated Rose, and the Bulls frontcourt overwhelmed the Warriors inside with center Andrew Bogut a last-minute scratch with flu-like symptoms.Gasol had 18 points and 16 rebounds, and Joakim Noah had 18 points and 15 rebounds as the Bulls pounded the Warriors down low. They outrebounded Golden State 61 to 48.Thompson had 30 points and 10 rebounds, and David Lee scored a season-high 24 points for the NBA-leading Warriors (36-7), who lost on their home floor for the only the second time all season and the first time since San Antonio knocked them off on Nov. 11. ”I never felt like we got into our flow. A lot of that had to do with their defense,” Warriors coach Steve Kerr said. Indeed, Tom Thibodeau’s team clamped down after the Warriors started 9 for 20 from 3-point range. Golden State missed all 13 attempts from beyond the arc after the first half.Stephen Curry still put the Warriors in position to win, capping a 7-0 spurt to start the fourth quarter with one of his biggest highlights: faking a behind-the-back pass with his left hand and throwing a no-look toss over his right shoulder to Lee for a dunk that put the Warriors up 88-79.But just as he did throughout the night, Rose brought the Bulls back – inspiring a louder-than-usual visiting crowd sprinkled around the arena to a light roar each time.The Bulls capped their closing burst by trapping Curry in the backcourt and forcing him into an errant pass. Rose came up with the ball and fed Kirk Hinrich, whose 3-pointer put the Bulls up 107-105 with 15.8 seconds remaining.Andre Iguodala missed a 3 after a timeout, but Green pushed Noah aside for the tying tip-in. Rose’s long-range heave at the end of regulation was never close.Neither team could create much separation in the extra session.Green stole Hinrich’s inbounds pass in the final minute before Thompson missed a 3-pointer on the other end. Rose dribbled out the shot clock, then hit the jumper over Thompson to put the Bulls up for good.After a timeout, Nikola Mirotic fouled Iguodala behind the basket as he jumped. Officials ruled Iguodala was not in the act of shooting, giving Golden State the ball on the side, while Kerr called on them to award Iguodala two free throws.Thompson still managed to break free on the inbounds pass, but he missed the running bank shot to finish off Golden State’s loss.Kerr said Bogut came up to him just before tipoff to tell him he was too sick to play. It’s unclear how long the Warriors’ defensive stopper could be out.The Bulls also were missing a key piece to an illness. Shooting guard Jimmy Butler missed the morning shootaround and sat out with an illness. He is day to day. NOTES—Assistant Coach Adrian Griffin was called for a technical foul in the second quarter after arguing with an official. Thompson missed the technical free throw. … Forward Taj Gibson limped off the court just before the half with an apparent right leg injury. He came back in the third quarter…..The Warriors fell to 14-1 against Eastern Conference opponents. … The Warriors were trying to sweep the season series against the Bulls for the first time since 2000-01…..The Bulls face the Lakers in L.A. on Thursday. COLLEGE PARK—The 13th-ranked basketball team in the country shouldn’t require a furious comeback and a very fortunate tip-in to beat a struggling squad at home.Maryland coach Mark Turgeon knows this. Yet he had absolutely no complaints after the Terrapins did exactly that to squeeze past Northwestern 68-67 on Sunday night.Melo Trimble scored 27 points, and a put-back by Dez Wells with 1.4 seconds left enabled Maryland (18-3, 6-2 Big Ten) to avoid its first losing streak of the season. ”You’ve got to win games like that to have a great year,” Turgeon proclaimed after the Terrapins averted the upset. Maryland never led until Trimble made two free throws with 21 seconds remaining to make it 66-65. After Tre Demps hit a jumper for the Wildcats, Trimble missed a 3-point try and Wells snared the rebound before scoring with a layup off the glass. Northwestern (10-10, 1-6) called timeout but could not get off a shot before the buzzer sounded.There were several times during the game when it seemed Maryland was doomed. The Terrapins trailed by 14 in the first half and by 63-52 with 3:46 left.But Trimble and Wells led the Terps back, with help from a 3-pointer by Jake Layman that cut the gap to 65-62 with 1:05 to go.Trimble went 9 for 10 at the foul line and Wells scored 17 for the Terrapins, who bounced back after falling at Indiana by 19. Brian McIntosh scored 21 for the Cats, who have lost six in a row – the last three by a total of five points. Sanjay Lumpkin scored 12 points on 4-for-4 shooting, including 3 for 3 from beyond the arc. Northwestern shot 70 percent before halftime, but made only 10 baskets on 25 tries over the final 20 minutes and finished with 17 turnovers. ”You have to finish the deal, especially in this league where you’re playing really good teams,” Collins said. After going 16 for 23 from the floor in the first half, Northwestern went 0 for 4 with two turnovers at the outset of the second half.That enabled Maryland to close to 41-35, but the Terrapins then committed four turnovers in a 38-second span and went scoreless for more than three minutes to fall behind by 12.It was 54-42 with 12 minutes to go, and the Wildcats led by 11 before Maryland’s Evan Smotrycz made two free throws. Trimble followed with a 3-pointer, and a free throw by Wells cut it to 55-50 with 8:34 remaining.But while the Terrapins failed to score over the next four minutes, McIntosh made two straight baskets after a layup by Alex Olah for a 61-50 lead.That wasn’t enough to provide NU with its first victory in 2015. Bulls resume ‘sucking’. Lose to Heat in awful,listless effort. The Bulls, on the heels of two nice wins, played a complete stinker Sunday afternoon, but unknown Hassan Whiteside, who bounced around the NBA Development league and played in China and Lebanon, hoping NBA teams were keeping tabs and would give him an opportunity.He was in Charlotte, working out at the downtown YMCA, a few months ago. He then got his chance with the Heat and he’s making the most of it.Whiteside had an unconventional triple-double with a team-record and career-high 12 blocks to go with 14 points and 13 rebounds to help Miami beat the sluggish Bulls 96-84 Sunday. On Sunday, he made the Bulls miserable. His teammates did their part, too.Dwyane Wade scored 26 points, and Chris Bosh finished with 20.Luol Deng scored 15 in his return to Chicago. Mario Chalmers had 15 points, and the Heat squashed whatever momentum the Bulls appeared to be building after beating San Antonio and Dallas.Miami led by 10 at halftime, 12 going into the fourth quarter and remained in control the rest of the way.Wade and Bosh came through with strong performances. Deng had 10 rebounds and four assists in his first game at the United Center since the Bulls traded him to Cleveland last season. And Whiteside wreaked all kinds of havoc in just 24 minutes after missing two games with a sprained right ankle.Pau Gasol had 13 points and 17 rebounds, giving him 50 over the past three games. Derrick Rose scored 19 but missed all six 3-pointers.Aaron Brooks scored 17. But the Bulls fell to 13-11 at home.It was certainly not what the Bulls had in mind after handing the Spurs their most lopsided loss of the season Thursday in the United Center and then winning at Dallas the following night. Those two wins on the heels of a 2-6 slide seemed like strong signals they were coming around. But this was a big step back. 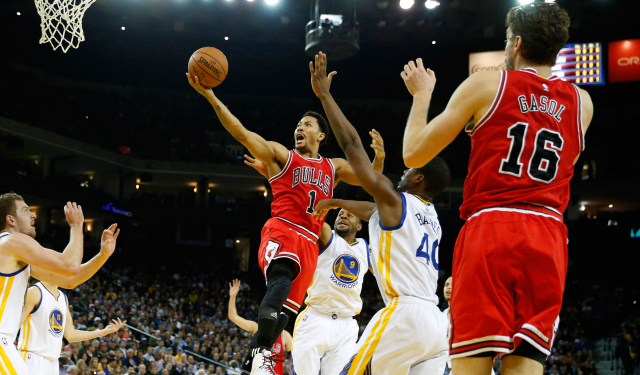 Worse, the Bulls are staring at a tough six-game trip that starts Tuesday at Golden State. The Bulls were within 83-76 after Brooks’ four-point play with 6:36 left in the game. But the Heat stayed in control thanks to three dunks by Whiteside in about a two-minute span.That spree started with an alley-oop from Chalmers and continued with a dunk over Gasol off a feed from Deng to make it an 11-point game.Whiteside then answered a layup by Taj Gibson with another dunk, his third in about a two-minute span. NOTES—It was an emotional day for Deng, who was back at the United Center for the first time since the Bulls traded him to Cleveland last year. He spent his first nine-plus seasons in Chicago. GLENDALE—J.J. Watt danced, Jimmy Graham dunked, Odell Beckham Jr. dazzled. The Bears Martellis Bennett caught 5 passes for 25 yards.The Pro Bowl in the desert was all about having a good time.Few moved very fast, no one flattened a quarterback and there were no bone-jarring hits in the gentle, friendly version of football played Sunday.Even in a game dominated by offense, Watt was the star.The Texans defensive end intercepted pass, recovered a fumble and led the crowd in dances during commercial breaks.Team Irvin defeated 32-28 Watt’s Team Carter, but the score doesn’t matter in the NFL’s all-star game. Everyone seemed to enjoy themselves, no one more so than Watt, moving to the music while the cheerleaders danced. In its one year out of Hawaii, the game drew a sellout crowd of 63,225.Memorable moments came from Graham, the Saints’ tight end who dunked over the crossbar twice after TD catches – this time with no penalty, and Giants rookie Beckham, who made a diving grab at midfield.Graham’s second touchdown, on a 1-yard, fourth-down pass from Matt Ryan, was the winning TD with 3:10 to play.Greg Olsen and Emmanuel Sanders also caught a pair of touchdown passes apiece. Andrew Luck was nearly perfect in his short time on the field, completing 9 of 10 for 119 yards and two scores. Matthew Stafford threw for 316 yards and two TDs and was the offensive MVP.The Pro Bowl took a one-year hiatus from Hawaii to be played in the desert a week before the Super Bowl. The big crowd watched the teams moved up and down the field, often without much resistance. If the players missed the beach, they wouldn’t let on. Romo knew this wasn’t a real NFL game.The NFL scrapped the AFC vs. NFC format last year in favor of having two big-name former players draft players four days before the game. This year, the honor went to Michael Irvin and Cris Carter.There were teammates playing against teammates.When Green Bay’s Jordy Nelson made a pretty fingertip touchdown catch from Brees for Team Carter. He celebrated with his Packers teammate Clay Matthews, who was playing for the other team.Beckham dove to the ground and gathered in Stafford’s long pass just as the ball was about to hit the ground. When Graham caught a six-yard touchdown pass from Stafford, he soared to dunk the ball over crossbar. The New Orleans tight end was fined $30,000 when he did that twice, and was penalized both times, in a preseason game. There was no penalty on Sunday.The goal posts were narrowed to from 18.6 feet to 14 feet on all kicks, not just PATs as had been previously announced. The PATs also were moved back to make it a 33-yard kick.The skinny posts claimed an unlikely victim when Adam Vinatieri missed two PATs. The 42-year-old Colts kicker hasn’t missed an extra point in real games in five years. He also missed a 38-yard field goal.Another rule was no blitzing. Denver’s Von Miller violated that one and, on the next play after the unsportsmanlike conduct penalty, Luck threw a 14-yard touchdown pass to his Indianapolis teammate T.Y. Hilton.Winners got what amounts to pocket change for them – $55,000 apiece, losers $28,000. COLUMBUS—It was enough to give a goalie nightmares: A record 29 goals, 25 players with at least two points and eight with at least four.In addition to the high-profile superstars who didn’t make it to Ohio’s capital city for the NHL All-Star game, defense also took a holiday.John Tavares of the New York Islanders matched a record with four goals, and Team Toews beat Team Foligno 17-12 on Sunday night in the highest-scoring NHL All-Star game.How much offense was there? Tavares wasn’t even the MVP, although that might have been due to a little home-cooking. Ryan Johansen of the host Columbus Blue Jackets had two goals and two assists for the losing side and was selected as the MVP in voting by fans on Twitter.Tavares was as gracious about the balloting as he was good on the ice.The players, at least those on offense, had a lot of fun once the game started. The wild, no-defense exhibition even featured a fake fight to go with goals in bunches.It was the most goals in the event’s 60-year history, eclipsing the 26-goal burst in North America’s 14-12 victory over the World in 2001.Tavares’ four goals gave him a share of the All-Star record that was established by Wayne Gretzky in 1983, and equaled by Mario Lemieux (1990), Vincent Damphousse (1991), Mike Gartner (1993) and Dany Heatley (2003).Voracek’s six points tied another mark set by Pittsburgh legend Lemieux.Captain Jonathan Toews of the Blackhawks had a goal and four assists, as did Boston’s Patrice Bergeron. Dallas’ Tyler Seguin had two goals and two assists, Filip Forsberg of Nashville, and Rick Nash of the New York Rangers – another former Columbus star – both scored twice, and Florida’s Aaron Ekblad and St. Louis’ Vladimir Tarasenko each had four assists.For Team Foligno, The Blackhawks Patrick Kane and Tampa Bay’s Steven Stamkos had two goals and an assist apiece, Philadelphia’s Claude Giroux had a goal and two assists, and Washington’s Alexander Ovechkin added three assists.Captain Nick Foligno, also of Columbus, was asked what he learned from being a captain of the team he helped pick. The fake fight provided some energy to a capacity crowd of 18,901 on the game’s first visit to Columbus. Late in the second period, during a scrum in front of the net, Ovechkin and Foligno pretended to mix it up with Calgary’s Mark Giordano and the Hawks Brent Seabrook.All of the players were laughing after they grabbed and hugged each other.It was fitting that Toews scored the goal that shattered the record. He held off defenseman Brent Burns of San Jose to find the net with a rising shot with 5:39 left.Toews said he was just happy to silence the cannon that fires every time the home team scores at Nationwide Arena. With the game tied at 4 after the first period, Team Toews broke it open with six goals in 9 1/2 minutes – and a record seven in the frame.The teams scored twice within 8 seconds in the opening minute and three goals in a 58-second span, as the arena announcer stacked up goal announcements and was three behind at one point.Nash, a former Blue Jackets captain who was booed every time he touched the puck, provided the go-ahead goal 4:08 in.Pittsburgh’s Marc-Andre Fleury, the only Penguins player in action after Sidney Crosby and Evgeni Malkin stayed home due to injuries, had a particularly forgettable period. He gave up six goals on the first 10 shots he faced.